Oklahoma police have released an extremely graphic body-camera video showing an officer chasing and shooting down a black man suspected of making gun threats. 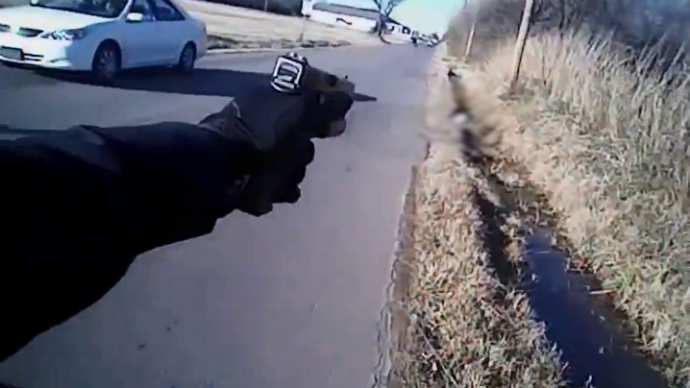 The first-person clip was meant to justify the cop’s actions, but raised controversy. In the video, Muskogee, Oklahoma officer Chansey McMillin is seen arriving to investigate a 911 call, which said an armed man was threatening a woman. The call was made by the local Pastor Andre Jones, and was about a woman attending a church wedding, who reportedly turned out to be the suspect’s girlfriend. McMillin’s body camera shows him approaching the man, identified as Terence Walker, and searching him in the street outside the church. (WARNING: SOME VIEWERS MAY FIND THE VIDEO EXTREMELY DISTURBING). The officer asks Walker, who is seemingly nervous, to relax. However, the suspect then breaks away from McMillin and sprints down the road, while the officer immediately chases him, readying his weapon. Seconds after, Walker drops something on the road and abruptly stops to pick it up. At this moment McMillin fires five shots at the man, with three of them hitting the target. Walker falls to the ground – he was later pronounced dead on the scene. Police searches his body and picks up an item, which is said to be the suspect’s handgun, but is not clearly visible. However, after watching the clip, many viewers found exactly the opposite, as Walker appears to be picking up an item when McMillin fires the first shot, and is running away with his back turned to the officer when he is shot dead. Did Terence Walker really point his gun at the officer as the #MSM alleges here? http://t.co/6Zqb2jEwsb It's not on the 9 min video? The video was released amid massive public discontent in the wake of Ferguson and Eric Garner protests, as well as after calls for police officers to be equipped with body cameras for more accountability. In Muskogee, 50 of the total of 88 police officers are said to be wearing body cameras since November. It comes on the heels of another controversial police shooting video, in which New Jersey a police officer shoots nine times and kills a black man who is apparently sitting in a car with his hands up and sticking out of the vehicle’s window, while another officer is searching the driver.